Thanks for visiting our page on school gardening! If you’re a school in Arizona, you may have heard that you can now get your school garden certified. This allows you to serve your food from the garden in the cafeteria. The way you get certified is through the Arizona Department of Health Services, and they’ve created a whole page on School Garden & Food Safety. Even with that, it can be hard to know where to start. So we’ve created this handy dandy checklist of how to get your school garden certified. We hope it helps you out! If you’re interested in educational resources around school gardens, we have a whole slew of them below. Arizona’s Department of Agriculture has dedicated a lot of time to ag literacy. They frequently host workshops, institutes, and have a whole page of curriculum lessons for students K-12. The Lexicon of Sustainability is all about creating a new generation of sustainability literate citizens who will become our future leaders…in other words, exactly what all you awesome people are doing. Through Project Localize, selected schools will receive curriculum, video tutorials, a regional food mapping system blueprint, and a whole lot more. Looks pretty cool, if their video is any indication. Contact the DFC executive director Kim Larkin through their website or her email. Dig In! helps kids, teachers, and parents explore a world of possibilities in the garden and on the plate using 10 inquiry-based lessons that engage 5th and 6th graders in growing, harvesting, tasting, and learning about fruits and vegetables. The Great Garden Detective Adventure is focused on helping 3rd and 4th graders discover which fruits and vegetables are sweetest, crunchiest, and juiciest through a series of investigations and fun experiences connecting the school garden to the classroom, school cafeteria, and home. “The mission of the Edible Schoolyard Project is to build and share a national edible education curriculum for pre-kindergarten through high school. We envision gardens and kitchens as interactive classrooms for all academic subjects, and a free, nutritious, organic lunch for every student. Integrating this curriculum into schools can transform the health and values of every child in America.” Go to their resources page. “This addition to the Center for Ecoliteracy’s Big Ideas suite of resources was created for publication on the National Geographic Education website in conjunction with National Geographic magazine’s 2014 series of articles, “The Future of Food.” Big Ideas (2014) identifies key concepts that link food, culture, health, and the environment.” Download the pdf. 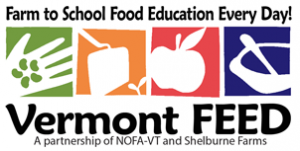 The Vermont Farm to School Education Every Day site has many free, downloadable guides on the 3 C’s: Community, Classroom and Cafeteria. They also provide a school lunch cookbook. 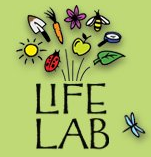 Life Lab began in 1979 as a school garden classroom in Santa Cruz, CA. They have put out several great resources that are available for purchase and a few free downloads to get started. Including this garden-based nutrition packet. They also have a YouTube channel where you can watch and learn quick and easy “backpocket” activities! “Cooking with Kids’ mission is to motivate and empower children and youth to make healthy food choices through hands-on learning with fresh, affordable foods from diverse cultures.” They are based in Santa Fe, NM and provide free tasting lessons by grade that are in both Spanish and English. “The National Farm to School Network (NFSN) is an information, advocacy and networking hub for communities working to bring local food sourcing and food and agriculture education into school systems and preschools.” Their Resources page provides access to information on many areas related to farm to school or farm to preschool. Remember that October is National Farm to School Month! 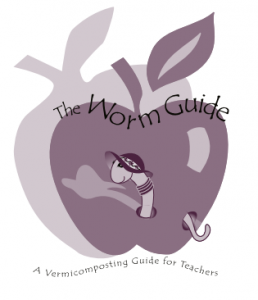 If you are interested in incorporating vermicomposting into the garden curriculum here are some ideas. Here are some resources from our local food bank, which teaches a number of classes on gardening and has developed several workshop packets. On gardening basics, like planting, watering, thinning, etc. If you’re curious to know what to plant when, esp. in the extreme weather of Tucson, check out the seasonal planting guide. But before you start gardening, you may want to learn about sustainable site design, and also, how to get prep your bed, so you have good soil and compost. 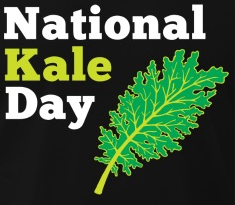 Kale recipes, nutrition, cooking tips and more! A video series that looks in depth at how a crop is grown.